The next Coffee and Cameras class series is March 13th, 20th, and 27th! This is a Tuesday morning class for adults 9:30-11am, held at 1345 Breton Rd, EGR. I have an upcoming photography project which requires a few fresh faces and test session models. The theme is Celebrating Motherhood and my desire is to get the moms out there in front of the camera and to celebrate your relationships with your child(ren). Please inquire by email to denarobles@gmail.com if you have any questions or would like to be involved on the dates listed above. Everybody's favorite assignment in the Kids and Cameras series so far is the Color Collage. I think it is also one of my favorite ways to push myself to photograph every day, especially in the slower winter months. Last December I did the project right along with my class participants. Before I venture into fuschia, vermillion, or cobalt variants of classic colors, (I won't ever really run out of colors will I?) I thought I should cover the 16 crayola box with grey, black and brown. Here is Color Challenge GREY! I love when this family calls me every year for fall portraits or with the announcement of a new baby! Here is the baby of the babies--Then, Later and Now again. This month I revisited the ColorColour Lovers Project with my own take on Purple. As I wandered the sidewalks and the market aisles in search of purple, I was mindful of all those who have touched my life in so many ways who were also touched and often times defeated by cancer. Tomorrow I join thousands of people in my small city to walk in The Relay For Life to commemorate those who have battled with cancer and to help fight for a cure. I ran out of colors to photograph during the week. And then it snowed. It snowed a lot. It snowed for days. So, WHITE happened. Not Black & White, but textural, patterned, light-tinted yellow, blue, grey, pink white. I love the isolation of subjects and the stark interest created by photographing white on white on white... Here are a few favorites. I solemnly swear that knowing how to make a good fresh guacamole is the secret to a long happy life. My kids will go off to college with at least this skill in their back pockets. Those ingredients down there? Chop them and mix them and mash them and taste them until they are perfect. Bonus points for extra salt and lime juice. Searching for green in my neighborhood last week meant kicking aside some snow, peeping for little peeks of earth and discovering tiny crocus shoots, running into friends to discuss the merits of painting doors green and thus feeling reconnected, and eating lots and lots and lots of green food. All good things. Last month I posted a series of ten sun drenched film photographs from our holiday trip to Puerto Rico. We experienced more than a bit of climate shock to return to the frozen north and we seemed to develop this 'look' between us. The silent look that whined "I want to go baaaaack." Back to reality. 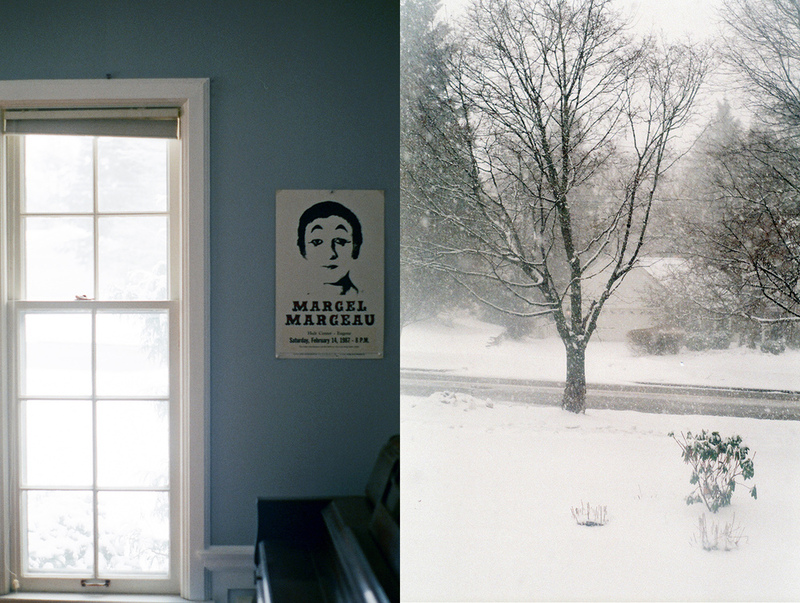 This month's series of ten film photographs were shot on January 10th. Winter in Michigan, the direct contrast of winter in the Caribbean. Winter in Michigan, where I cower indoors under multiple wooly layers, feeling like a bear hermit-ing away deep in a cave, always looking out the windows. And since I have no choice but to go outside many times a day, always yearning to be back on the warm side of the glass. Today the ground is bare, the snow has melted and the sun shone for a day, but it is frigid cold and the snow will likely return. I take my dog for her daily walk and as I dream about hot days at the lake and tending my vegetable garden in bare feet, I notice the tiniest green crocus and daffodil sprouts braving their way through the earth. And I know the worst is behind me. Fellow photographers Bethany and Charlene also shared 10 film photos this month. Please go view Bethany Petrik's blog from Woodland, CA which will then lead to Charlene Hardy's. 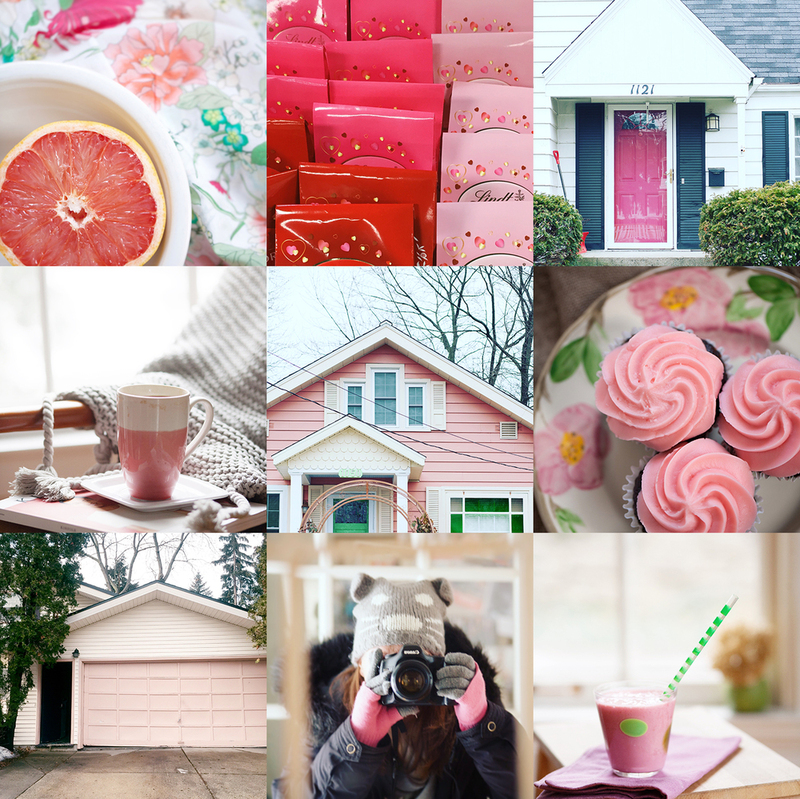 Last week on the Instagram Color Colour Lovers challenge my task was all things PINK. There is very very little pink to be found in my house. As I captioned on one of my pink photographs "I only work in black, and sometimes very very dark grey." (I AM Batman.) The funny thing is, color pops up everywhere when you have your eyes open to it. Every time I spotted something pink my heart did a little somersault. Pink in all this dreary grey sky and slushy brown snow...I'll take it. When I teach photography classes I always do a project-based lesson. It is one thing to sit in a hard chair and have formulas and light ratios and camera manuals and beautiful examples thrown at you just to go home and pick up your camera and say "wha?" Each of my classes is based on a start to finish project involving story, composition, perspective, exposure, editing, saving, archiving, artwork creation, printing and displaying. Along the way, you actually master your camera and the art form and have something to show for it. Win win. One of my first project-based lesson results in a lovely color collage on a photo field trip, similar to this one. If you are interested in joining one of my photography classes, please contact me at denarobles@gmail.com I currently have a middle school group forming, a high school group, and an adult group. After returning from a technicolor tropical paradise I am living in a cold, cold world covered in snow, everything around me is wet, white, mostly grey and sometimes icky brown and slick. I am craving warmth and color! I stumbled across this tumblr from Xanthe Berkeley and took her challenge to inject some color into my winter. Winter and I are not the best of friends. Too much cold, grey, lack of sunshine, and outdoor activities I enjoy. However, I am thankful for the forced hibernation for a month or so and for the chance to slow down, reflect and hunker down into my craft a bit. I do imagine if I were living in a milder climate I would still find a way to do all this though, so snow and frigid temps are not necessary! As always, I have a few photography projects brewing in the background of my commercial photo jobs. This year I am focusing on a weekly project I will unveil soon and also this monthly project: 10 on 10. On the 10th of the month I will release 10 film photographs on a theme. Simple as that really. The following photographs were actually created on Christmas day during our Puerto Rico vacation while my daughter and I shared a walk up the shore of Playa Flamenco. Enjoy! Fellow film photographer Charlene Hardy from Kennewick Washington also posted 10 film photos on the 10th. Click here to go see her beautiful work! This lovely veggie portrait is from my on-going Kitchen Table project. It is my hope to work all winter long on the kitchen series and be ready to publish Kitchen Table late 2016. It is going to be delicious. So very delicious.